I don’t know about you, but I find meditation a pretty essential part of life these days. It’s the antidote to our multi-tasking, high speed, over-scheduled lifestyles. Just a few minutes a day to stop the clock. Ironically, I’d love to meditate longer each day, but I’m just too busy. 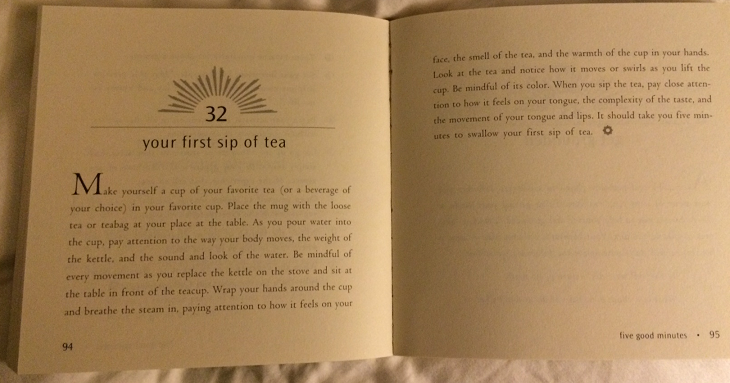 So for me, this little book was a real find. (Actually it was a gift from my wife…). 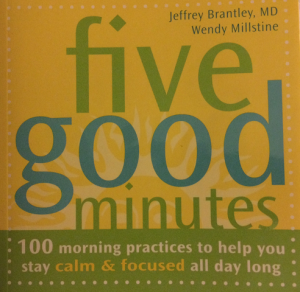 “Five Good Minutes,” by Brantley and Millstine, advocates meditating within the first few seconds of waking up, before your brain starts for the day, before you become distracted, and hopefully while your mind is still open to receiving new thoughts and ideas. And for me it works…. So imagine the smile on my face when I opened the page to today’s exercise and found this!